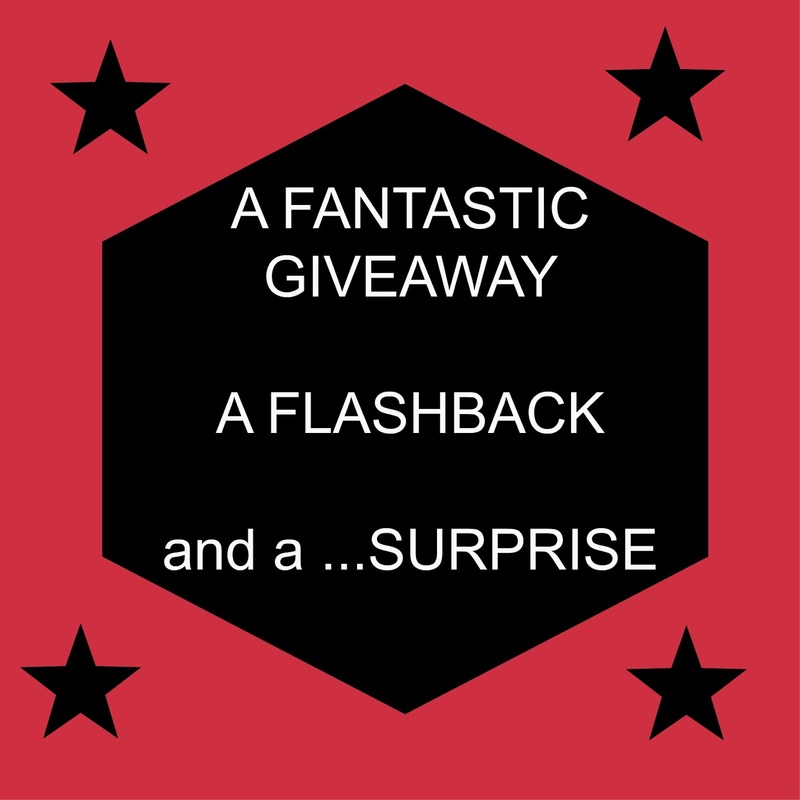 Home » Being A Wordsmith » It’s My Birthday Complete With Giveaway, Flashback, and Surprise! Thank you for stopping by to celebrate my birthday today! I am, no doubt, truly blessed to see another birthday. Thank you, God! This year–like most–I typically do low key things for my birthday. Dinner out, or a weekend in the French Quarter (yes, I think that’s low key but I love it just the same), or an evening at home with my family with take-out from Outback Steakhouse. However last year at this time, I had the BEST BIRTHDAY OF MY LIFE. You have probably heard me talk ad nauseam about my goals last year as I approached my 40th birthday. Taking a celebratory trip was something I talked about wanting for years. I wanted a fun-filled odyssey to somewhere tropical with my family and friends–ladies only. Around June/July 2012, I realized my big plans were not going to come to pass. Hubby, sensing my disappointment, proposed that the two of us take a trip together to celebrate. I got excited because Hubby doesn’t talk about taking a trip unless..HUBBY PLANS ON TAKING A TRIP. Seeing an opportunity to make it even more exciting, I prompted him NOT to tell me where the destination would be. That’s huge for me, a detail-oriented SUPER VIRGO, but I love surprises. I had no qualms about flying on 9/11. I was so excited about going on a trip for my milestone birthday. The best part was I truly didn’t know where we were headed to. The only things Hubby shared with me about our 7 night, 6 day trip were: 1) It was somewhere tropical 2) It was NOT a cruise 3) We had never been there before and 4) I needed my passport. I breezed through airport security with my laptop, iPhone, no shoes, cap, sunglasses, and wired bra. I was going to Mexico. TSA couldn’t upset me one bit with their electronic wands and too-long glances. I was on a serious high! I couldn’t resist showing you a pic of The Deuce, who stayed behind with his grandparents so he could keep his routine and go to school. Thank God for grandparents! Hubby is not a romantic guy. Never has been. But I have always known that about him and I’m OK with it. After 20+ years together, a romantic gesture on his part would probably send me into orbit. But what the man can do is show me a good time, take care of me, and fully engage me in his taste for the finer things in life. The resort we stayed at was Paradisus La Perla in Playa del Carmen about 45 minutes outside of the touristy area of Cancun. The beauty of the resort was breathtaking. Interior and exterior. It was also all-inclusive. Because it was off-season and the the resort was less than a year old, we had the entire place practically to ourselves. The first night we had a little snafu with the A/C, but we managed because we loved the place. The following day, my actual birthday, brought the pleasure of an upgrade to one of the “swim-up” rooms in which we could step right out into the pool from our patio. Hubby asked what I wanted to do that day since it was my birthday. I just wanted to relax in the pool, read the book I was into, and enjoy the never-ending drinks with Tamarind on the rim. There were quite a number of restaurants on the property. That night we dined at Passion. It featured an exquisite tasting menu from a 7 star Michelin chef. The restaurant staff was well aware that it was my birthday and I received a special dessert. Hubby had entertained me for as long as he could. But I know him, when he goes on vacay, he does not want to vacay. He wants to go, go, and did I mention GO?! So I caved (pun intended) and we went on an excursion for rappelling, zip lining, and snorkeling through the Riviera Maya to see stalactites and stalagmites. 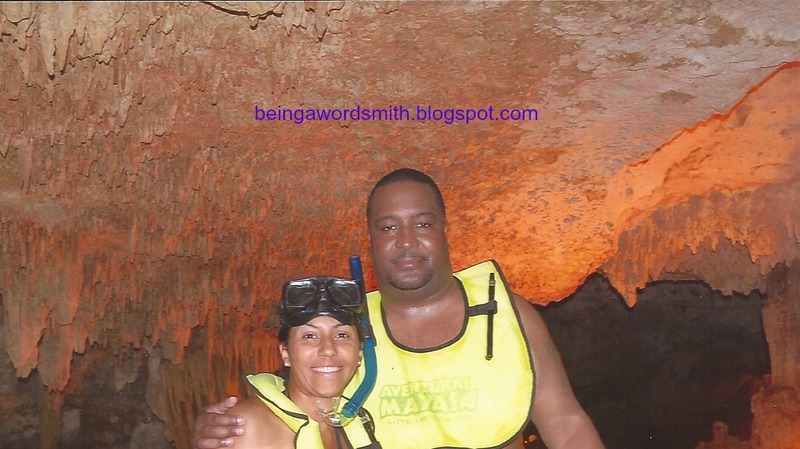 Here’s the thing–like my new blog buddy Kenya says–I was clueless about rappelling and zip lining and THOUGHT I could manage snorkeling due to the advanced swimming lessons I had just taken the last 2 months. Rappel: Me: 100% FAIL. I took one look at it and said HELL NO! Hubby: SUCCESS-Just call him Tom Cruise aka Ethan Hunt. I was disappointed because I was bailing on all these things that we had planned for the day. 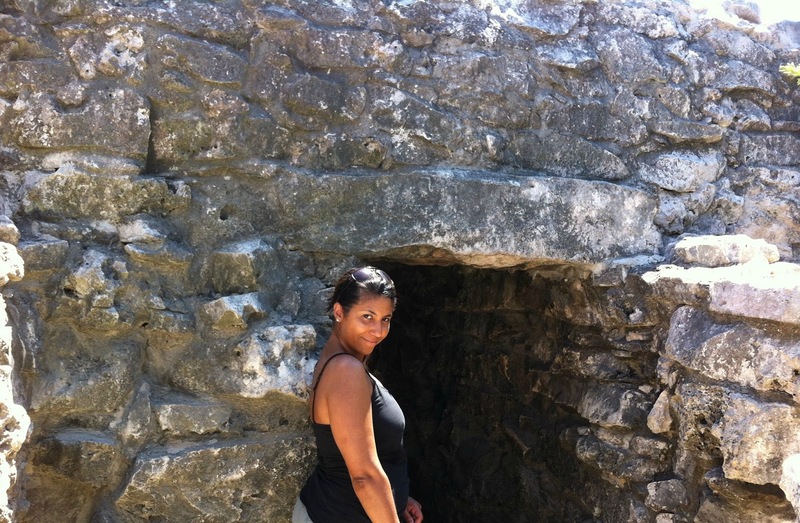 I did manage to enjoy seeing the Mayan Ruins with the backdrop of the Caribbean Sea. I found it quite ironic that it was 2012 and we were walking among them. We returned to the resort exhausted and dehydrated. Hubby wanted to stop by the bar in the pool area on the way to our room. As we approached the bartender, I felt like my eyes were playing tricks on me. I saw a woman sitting at the bar that looked strangely familiar. As I got closer to her, I thought “She looks like Margaret.” Then I thought, “She’s wearing lipstick like Margaret’s.” Margaret is my BFF that lives in Detroit. When the woman turned toward me, I realized IT WAS MARGARET! I stood there stunned looking at her. I kept asking her what she was doing there and did she know I was going to be there. I looked around for her husband. I was not processing that she was standing in front of me. Margaret was with me the day of my cancer diagnosis and the day I learned I was in remission. She was with me when I went into labor with Deuce through to the next day when he was born. I looked to my husband who had this odd grin on his face. The puzzle pieces started to fall into place. Margaret’s arrival had been planned months in advance. I finally closed my mouth, hugged her, and started crying. It had been a little over a year since I had seen her. We sat at the bar and talked–catching up on each other’s lives. I was still in shock that she was there. I didn’t realize that Hubby had disappeared because we were so busy talking. I had a fleeting thought while sitting there when I felt a tap on my shoulder. I turned and there was the object of my fleeting thought. My other BFF Felicia! I jumped off the stool and stood back to look at her. OMG! OMG! OMG! I grabbed her and cried like a baby. Then she started crying. And Margaret started crying. I looked over to see Hubby standing there taking it all in. Felicia lives in Atlanta and it had been over a year since I last saw her as well. She was a bridesmaid in my wedding, has been with me through thick and thin, and is my RIDE OR DIE chick. My fantastic husband had planned the best surprise ever for my birthday. He knew that those two women were my closest friends in the world. And he arranged for them to celebrate with me for 3 nights and 4 days. The three of them had been planning it all for months. I had no idea! I soon learned that all of the staff at the resort knew about the surprise and had been working with Hubby to pull it off. I had birthday dessert 4 of the 6 nights we stayed there. The customer service was just as spectacular as it was at the Sandals Resort in Jamaica for our honeymoon. I was in heaven. I got the trip I hoped for and had a ball. So blessed. When was your best birthday ever? What an awesome birthday surprise!! Your hubby did well!! He did! I am still amazed that he pulled it off. Makes it hard to be mad at him sometimes. LOL. Last year’s birthday sounds like it was a blast! I hope this years birthday was also really special. Happy sits feature day! It was the ultimate birthday celebration. It’s going to be hard to top in the future, but it will be fun trying. Thanks, Corlie! Oh my goodness, your husband did such an amazing job!! I would have been blown away, for sure! Hope you had a wonderful and blessed birthday! Thanks, Mandi. I had a nice relaxing day. I appreciate you commenting. Happy Birthday! That is an awesome story! Your hubby rocks! That is the best surprise ever!! Mine did something kind of similar with my friends years ago (no vacation involved though). He had my two BFFs fly here from Colorado (where I grew up) for my 30th birthday (a long long long time ago). It was a huge surprise! 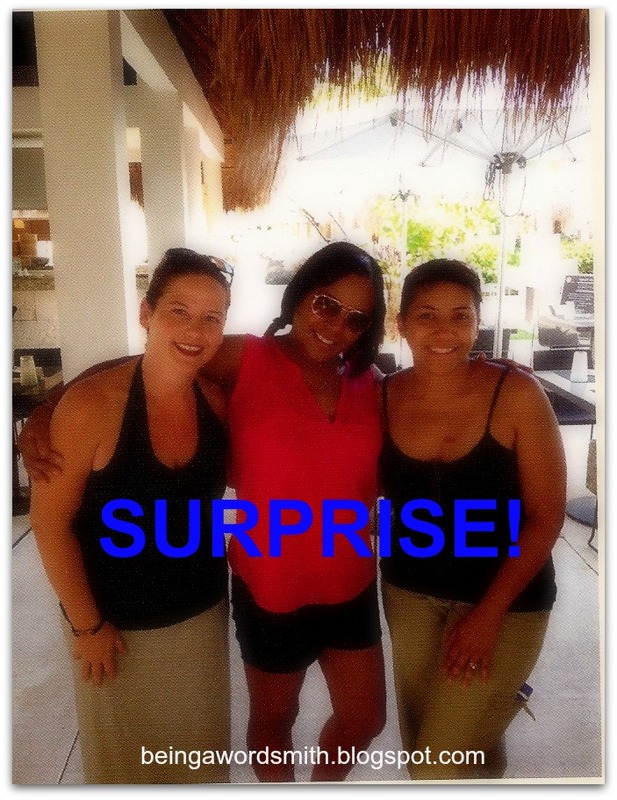 True surprises are the best! The ones you really don't see coming. Thanks, Michelle. Happy birthday! I'm not sure if I will get my post up since I've been traveling all day but I at least wanted to stop by and send big birthday wishes to our Blog Challenge hostess! How sweet, Mo! Thank you for remembering and stopping in. I really appreciate it. I'm wiping tears away, what a touching story about last year!!! Awwww, thank you. I cried while I writing the post. It was very special. Thank you for stopping by, Amber. Ugh, I'm so ashamed that I'm just making it over here. It's been a rough couple of days my love! Charge it to Walgreens please, the gym, a d not my heart. I hope you had an amazing birthday. A very HAPPY BELATED! Now, hubs was so on point with this. Your recap made me feel I was there. So sweet that he had those special ppl in your life there. What a blessed union you have & that was one heck of a birthday! It's all good. I know you are a busy woman! I appreciate you participating and linking up. It means a lot, Joi. I'm gearing up for your challenge. This was so awesome to read!!! It is such a blessing to have wonderful people in your lives! My girlfriends hold a very special place in my heart ~ even if we don't see each other on a regular basis (yes, even years) we can always pick up like it's been hours. Happy belated Birthday to you!!!! That is exactly what it's like when I see or talk to these two. Like no time has passed. That is really important when you live far apart and have busy lives. Thanks, Michelle. The best post ever!! I think I lived through each sentence…shedding tears at the end! Our Parrain is THE BEST! I pray my 40th celebration is equally special! 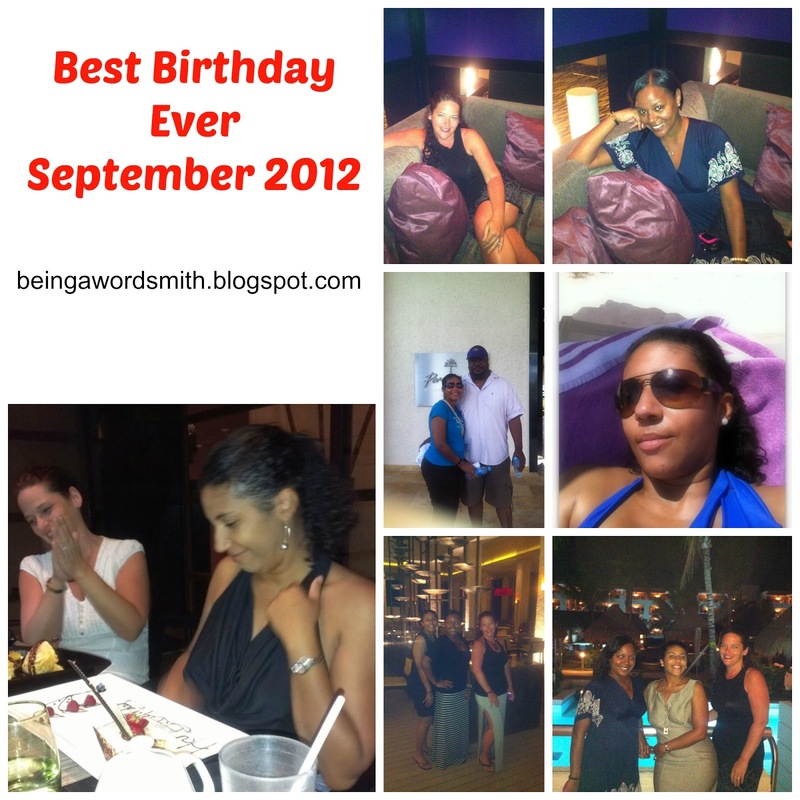 With all of that…I don't think any birthday will top that one…LOL! What an awesome read & story! Thanks for sharing!! 🙂 Keep up the awesome work! Thanks, Laniakia. I so appreciate you stopping by, reading, and commenting. Yes, Parrain is the best. I don't think I'll ever get tired of telling that story. I still can't believe they surprised me like that. Thanks, Chene! Awwww Kimberly….I'm crying now!!! That was an awesome birthday gift from the hubby!!! 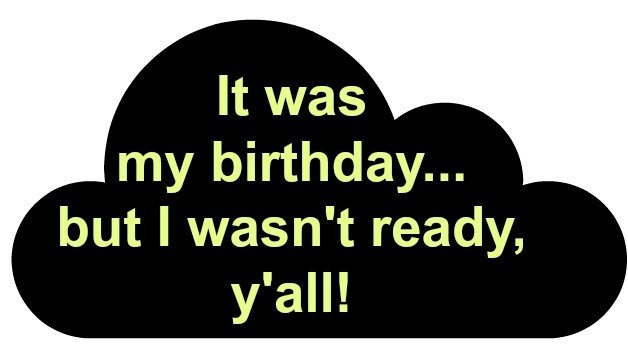 Can you believe it, I don't have a “birthday” post…IKR! Well, I do, kinda sorta, lol. It was just a “DYWW” linky-party MENTIONING my birthday, so I guess that doesn't count, huh? Anyway, linking or not, I just wanted to come over and wish you a VERY HAPPY & BLESSED BIRTHDAY lady!! ENJOY!!! Oh, and thanks so much for linking up! I appreciate it, Michell. Glad you enjoyed the post. Thank you, Hope. Deuce thinks he is Michael Jackson. Ironically his first and middle initials are MJ. I hope you are having a wonderful birthday!! And what a hubby you have — I would say “romantic” is buried in there somewhere!!! Yes I think his romantic is in there somewhere. He makes it very hard to get mad at him about anything. Just when I'm about to go there or have gone there, I think about that trip. Sigh. Thank you. Happy Birthday! Sounds like you have Prince Charming as a husband! I, too, turned 40 last year and felt the need to mark it in a special way. I was dreading the big 4-0' but with all the celebrating I made peace with my forties. Very memorable. I enjoyed putting the pictures together for this post and reliving it all over again. Thanks for stopping by. Happy Birthday Kimberly! What a great Birthday you had, hope it is special this year too. many Blessings, Anna. I appreciate that. Thank you for commenting, Anna. Wow! Your hubby may not be romantic, but he is freakin' awesome! How many would arrange to have your BFFs there!? What an awesome birthday! The big 4-0 isn't that far off for me either, and I've love to do a gal-pal getaway too. Starting to save now! Yes, treat yourself, Mikaela. Well worth it! Hope you have an AMAZING birthday!!!! Sounds like you have a lot to live up to for the day. I'm jealous of your trips. That was a once in a lifetime type of birthday. It's going to be hard to beat. You take great trips too though. Thanks, Kate. Waaaaaaaaaah!!! This was so freakin' SWEEEET! I wasn't prepared to cry after I was laughing at your fails. I succeeded at zip lining this summer. I remember saying to myself that I was glad I didn't chicken out because that was a long way to go back. Christopher did it too!!! Sorry I had to rub that in. I have no idea what rapell is. I am going to go google it. I am like you and would have wanted to chill and read up book and take in the scenery. My husband does not want to relax on a vacation. Enjoyed reliving your birthday through this post. So sweet your BFF's were there. Happy Birthday!!! Thanks, Kenya. It was a week of all kinds of emotions. I remember reading your post about zip lining. Everyone I talk to says they were scared at first but were glad they did it afterward. I couldn't deal with the height. I thought I was too far up for the first tower. When my husband was done, he told me to be glad I didn't do the first one because the following ones went higher. OH NO! Totally laughed when I got to “Here's the thing…” now let me go finish reading. I'm eatin' this post up like it's chocolate. Glad you got a kick out of that. Okay, call me a sap, but yes I actually got teary eyed when I got to the part where you ran into your friend Margaret. That had to be the coolest birthday ever! Two thumbs up for the hubby! Now can I have YOUR husband talk to MINE??? Mine, poor fella, can learn a thing or two in the birthday celebration department. For my 40th birthday, NO ONE remembered my birthday! I had just recently had the baby and everyone was so excited over her, that my birthday was actually forgotten. Can you say disappointing? Yep, I got teary-eyed too. What a wonderful thing for your hubs to do, Kimberly. Just awesome to be surrounded by your besties on your milestone birthday! My recent post I’m not here for the fear! It really was the best present ever. Just what I wanted. Oh no! I hope you partied it up later! I remember being ignored when my son was born. You go to visit someone and they don't even say hello to you because they are fussing over the baby. My son is 6 and it still happens! Tell your husband that you need a DO OVER. lol Thanks, Kennie. Kimberly, here's wishing you a marvelous birthday, my dear! May God continue to bless you and your family in every way. Thank you. Your birthday post was very inspirational.